Question about redline Gear oil. Of course MT-90 is still available. MT-85 is just a 75-85W, MT-90 is 75-90W…. I’d bet a 6-pack you would NOT be able to tell the difference in shifting. If you live a colder climate, the MT-85 would flow a little better at lower temperatures. Regarding shifts… for me it may be very difficult to determine “how” a shift should feel. I prefer a “crisp” shift where there is a detective feel in my hand at the shifter when the gears change. After having two W56 5-speeds rebuilt, the shifts were tight, with some noticeable momentary force at the moment of gear change. Once the new synchros become balance in their friction forces, the shifts became smoother with less detective force at gear change. After 100K+ miles on synchos the feel of the shifts become harder and require more force at the stick to change gears, either shift up or shift down, more on down-shifting. I’d go with whatever Redline Technical people advise…. They are the experts. If I lived in a cold climate, I’d be running full synthetic oils and gear lubes. That just my opinion – it may be worthless. I've got a return from Amazon, I'm getting Redline MT-90 instead of the 85. I replaced the clutch master and slave, as well as the shift seat with a Marlin Delrin seat. She shifts great, sometimes in second it doesn't shift how I'd want it to. But I realized, EVERY other G52 I've driven has been like that. I'm just super duper paranoid because it's my new truck! Old truck has valve tap like a mofo, this new one barely does and I still freak out. Good news, I am almost at 600 total miles on the rebuild! Yesterday I put a little over 50 miles on it and it never once gave me a single issue. Oil level stayed consistent. Which, after letting the truck leak a bit more I CAN confirm it's the oil pan and NOT the rear main. I got a good flash light and looked in the peep hole and it's dry as can be. I appreciate all the help everyone has provided, specifically you Gnarls! I'd buy you all a beer if I could. ...I CAN confirm it's the oil pan and NOT the rear main. I got a good flash light and looked in the peep hole and it's dry as can be. That's why I asked if you could see motor oil or gear oil seeping through that little hole. Well.... thank you Toybrota! I'd take you up on it if I could. I have gotten many great tips and information from people who are willing to take the time to share it on forums like this one and I always enjoy giving back something if I can.... even if it turns out to be a worthless opinion. I am proud of you for being smart about rebuild and for taking the time to share your experiences here on the forum. I hope that engine runs like a raped ape for many years! An idea. Right now I'm doing nothing. I swear just one drip in my driveway from overnight. Just gonna drive it and enjoy it. Near the 600 mile mark on the rebuild. All city driving. Varying the RPM as much as possible. Hey all, since the last two fuel ups I've been getting over 17 mpg! I think that's pretty darn good considering it's a fresh rebuilt motor. I'm just about to hit 700 miles total. I've been saving my receipts and documenting my mileage ever since the engine first started, partly because I deliver food on the weekends and I want a tax write off. Also, so I can see how many gallons and how far I went for each tank. After the first 1000 miles when I start driving it on the freeway, I am certain I'll get better MPG. Yeah, it's not been on the freeway. The new engine "break-in" I've been following is what Toyota recommend in the owner's manual. Don't go over 55 for the first 1000 means no freeway. No cruising at speeds for long periods of time. What is your timing set at? Engine rebuild break-ins.... very interesting topic. Getting 18 MPG. Gonna hit 1000 miles on the rebuild today. Runs and drives amazing. Going to start taking it on the freeway for small short distances and working my way up to assess reliability while cruising longer distances. I'm limiting my speed to 70 MPH as that only has the engine spinning at 2800RPM. Also, 600 miles on this oil change and NO oil consumption whatsoever. Oil pan drips a drop or two overnight. Cam is wearing great. No valve tap. I'd say this rebuild was a success! The biggest trip will be from Salt Lake City to Vancouver WA in a few months when I move. No doubt in my mind it'll do great. Sure can! There's tons of guys up in the PNW with Toyota's. Yotashop is up in Vancouver too, I'm gonna see if I can secure a job with them if they are hiring! First trip on the freeway went well! Did 70 no problem. Truck does vibrate a bit at speed... But that's for a separate thread. I also attempted to go have it emissions tested, with no smog equipment on the motor. Why? Well, I'm a strong believer that it would pass the tail pipe test, just not the under-hood "visual" test. I wanted to test this theory, but they wouldn't even test it with no smog stuff on board. That conversation was followed up with me asking if they are obligated to tell the authorities of my non compliant vehicle. I can confirm they don't. Just ask automotive shops if they have a 5gas. Also, it would almost certainly pass the wa state test cause they jacked up the numbers about 6 years ago. I wanna say 400ppm on HC, fogot what CO was? Basically, if you dont have dead miss, you PASS! luckily, in Vancouver no emissions 25 years old and back! They also are fine with street legal dirtbikes. Gotta move somewhere else... No emissions on anything here! Even newer vehicles, wait for warranty to be done and rip all emissions off. Well, I've almost hit 1000 miles on this oil change, and there is NO drop in oil level. That's with a slight oil pan leak! No oil consumption makes me happy! 1500 miles on the rebuild now. Runs like a raped ape. Really been fightin' to get absolutely no valve tick. I'm guessing most just give up after awhile. Aluminum rockers will make a bit of noise. Only way I've got rid of it completely is to use the old style steel rockers. Don't stress on it too much. You will be fighting a battle I don't believe you are going to win. These engines make rocker noise. The very best you should expect is to get the rocker tick balanced across all 8 valves. By the way... a bad stock fuel pump can sound like rocker tick. And... an exhaust leak at the exhaust manifold or header can sometimes sound like rocker tick. Also... if you not paying attention, a timing chain can also sound similar to a rocker tick. That's just my opinion - in may be worthless. I've been setting mine to 0.007 and 0.011 COLD, which is NOT what Toyota said. I've read that Marlin recommended as small as 0.006 and 0.010 to make them quieter. Always seems to be the back two intake valves. As far as the fuel pump, I know they can make a noise, mine is silent. Chain is good too, checked today. As always, thanks for your opinion! You've done a bunch to help me with questions and I really appreciate it. I would definitely try setting the lash with the engine warmed to normal running temp. I spent many hours with my 22R and the valve lash adjustments! A tighter lash will make the cam look bigger, it will increase the HP at the higher RPM range. A looser adjustment will make a little rocker tick and will increase torque number at the lower RPM range. I don't really know what the factory valve lash adjustment was on my first 1986 22RE when I drove it off the dealer lot, but, I agree the rocker tick was not very noticeable. Pull up a couple videos of any old time v8 equipped with a solid lifter cam and you will hear the same type of noise. I caution all of you on adjusting the valves beyond 7 and 11. Thanks for the advice. I always break out my 1/4" drive torque wrench to get the acorn nuts just right. Next time around, I'll adjust them to 0.008 and 0.012 Warm and see what it gets me. I'm curious to read about what your warm engine valve lash adjustment and rocker noise sounds like? Haven't adjusted it yet, it's fine right now. Sometimes it'll tick more and then it stops. Kinda like a bipolar teenager. Pulled this vacuum cap off for the hell of it today, and there was a bit of fuel. This goes to a charcoal canister, and is supposedly a vapor vent. 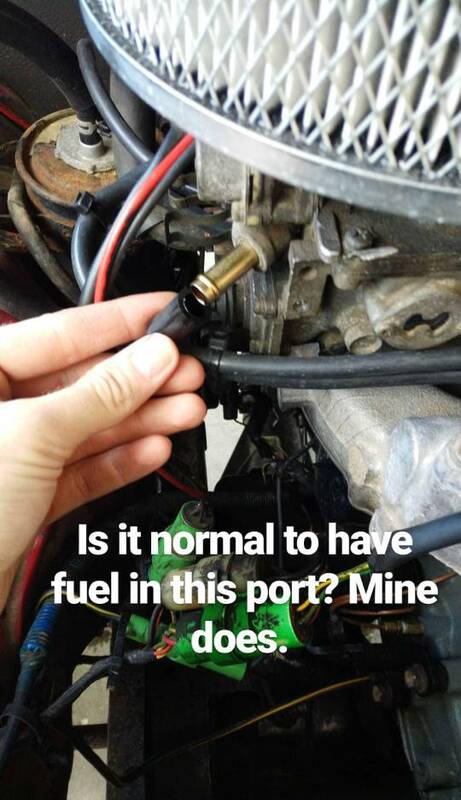 Is it bad if there's a bit of fuel that came out? Since it is a vapor vent, I can't see why it wouldn't be abnormal. 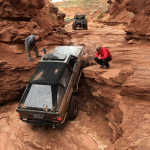 The truck occasionally will be a bit tricky to start after it's been running and it sets for 5 min, almost like it floods a tad. No big deal, always starts and runs normal.